Thanksgiving is all about being grateful for what you have. And this year, Maid Brigade – the leading green house cleaning services company – hopes that caring for the environment and the health of your family are at the top of your holiday wish list. According to the Centers for Disease Control and Prevention (CDC), the most common foodborne illnesses are caused by the bacteria, Clostridium Perfringens, which is commonly found on raw meat and poultry. The CDC reports that one in six Americans are affected by foodborne illnesses each year – 128,000 who are hospitalized and 3,000 who die – simply from undercooked, improperly refrigerated, or unsafe preparation of meals. •	Use only non-porous chopping blocks and cutting boards for food preparation because wood grains may harbor bacteria. Disinfect cutting boards using your own all-natural kitchen cleaners. Try rubbing a slice of lemon across the surface. For tougher stains, squeeze some of the lemon juice onto the spot and let sit for 10 minutes, then wipe. To kill germs, mix 2 cups of water, 3 tablespoons of liquid soap, and 20 to 30 drops of tea tree oil. •	Apply disinfectants to countertops and other kitchen surfaces and allow the solution to sit for several minutes before wiping for maximum kill benefit. •	Remove and discard outer leaves of lettuce, cabbage, leeks, and other leafy vegetables. Wash produce using a mixture of lemon juice and running water to provide a more thorough cleansing. Only slice vegetables on a well-cleaned cutting board and avoid leaving them sit at room temperature. •	If you’re ill, pass the food preparation duties on to someone else. •	Avoid cross-contaminating foods by washing hands, utensils, and cutting boards after they have been in contact with raw meat or poultry and before they touch another food. The mechanical process of hand washing is superior to alcohol-based hand sanitizers to kill food-borne bacteria. •	Put cooked meat on a clean platter rather back on one that held the raw meat. •	When cleaning up after the feast, use containers that can be washed and reused. Avoid plastic wrap, which contains PVC and is harmful to the environment. If you must use something to wrap your leftovers, use aluminum foil, it can be recycled. •	Refrigerate leftovers if they are not going to be eaten within four hours to eliminate bacteria growth that occurs rapidly at room temperature. •	Divide food into small containers for cooling and refrigeration. This allows food to chill more quickly, which prevents bacteria growth. •	Check to see what the acceptable internal temperature is for the type of meat or poultry you are cooking and use a food thermometer to be sure that it’s cooked enough to kill bacteria. Whole meats: 145°F (allowing the meat to rest for 3 minutes before carving or consuming). Ground meats: 160°F. Poultry: 165°F. •	Cook all eggs until the yolk is firm. 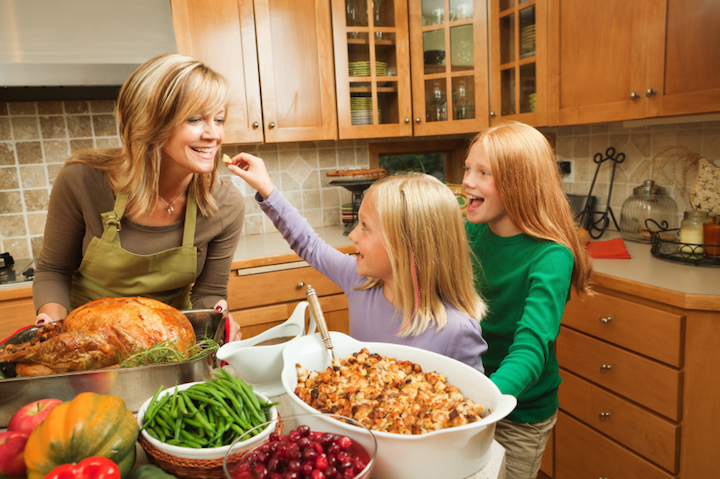 •	Be especially careful preparing food for children, pregnant women, those in poor health, and older adults. About Maid Brigade: Maid Brigade cares about the health of today’s families. With more than 25 years of experience, the company is the national leader in green cleaning practices and has a longstanding legacy of offering the latest in maid services and technologies. Maid Brigade is the first and only Green Clean Certified® housekeeping services franchise that implements a certification program for green house cleaning so customers know that they’re getting a green cleaning that is safe and truly green. For more information on Maid Brigade or for more healthy living cleaning tips visit http://www.maidbrigade.com or http://blog.maidbrigade.com.